The steady outpouring of new albums, reissues, and V/A & single artist compilations from 1631 Recordings shows no signs of abating and that is great news for lovers of modern classical & ambient music. This travelogue presents a globe-spanning selection of seven of the more recent entries in their catalog, as well as their publishing/licensing offshoot 1631 Music, including the second volume of their outstanding Piano Cloud series as well as albums by Egor Grushin, Simeon Walker, The Bird’s Companion, Gabriela Parra, Marco Caricola, and JP Hartnett. The first volume in the series set the bar high right out of the gate, but volume two proves to be just as expansive, expertly curated, and exquisitely beautiful as its predecessor, offering twenty tracks by a stellar group of artists each of whose solo work can be enthusiastically recommended. What elevates this collection to an even higher level is that it is so much more than just a showcase sampler. A delicately sustained mood and thoughtful sequencing turns it into a cohesive album listening experience. It is a collection no lover of modern classical solo piano and minimalistic beauty will want to be without. Contributing artists: Matti Bye, Federico Albanese, Angus MacRae, Clem Leek, Jacob Pavek, Chad Lawson, Tom Adams, Stefano Guzzetti, Dirk Maasen, Luke Howard, Matthew Roth, Mike Lazarev, Amanda Bloom, Antonymes, Ilya Beshevli, Tambour, Iván Muela, Alex Kozobolis, Sophie Hutchings, Rival Consoles (bonus track artist). Egor Grushin is a classical crossover / modern classical composer and pianist from Lviv, Ukraine. Whole some of his recordings feature ensemble work, such as the recently released Once, this collection focuses strictly on Grushin’s elegant and expressive solo piano compositions which resonate with thoughtful romanticism. Preface is the debut EP of pianist/composer Simeon Walker from Leeds, UK which 1631 Music is reissuing digitally with two additional songs including ‘Compline’ which you can find in Nils Frahm’s official Piano Day 2016 playlist. Each piece balances minimalism with melancholic beauty for a particularly intimate and introspective feel. Does the album title have a double meaning which implies more to come? That would be most welcome. The Bird’s Companion is the solo project of Casey van Wensem, a composer, musician, audio engineer, and writer living in Kelowna, British Columbia. Selected Works brings together nine pieces from his previous EPs, singles, and film/TV works. 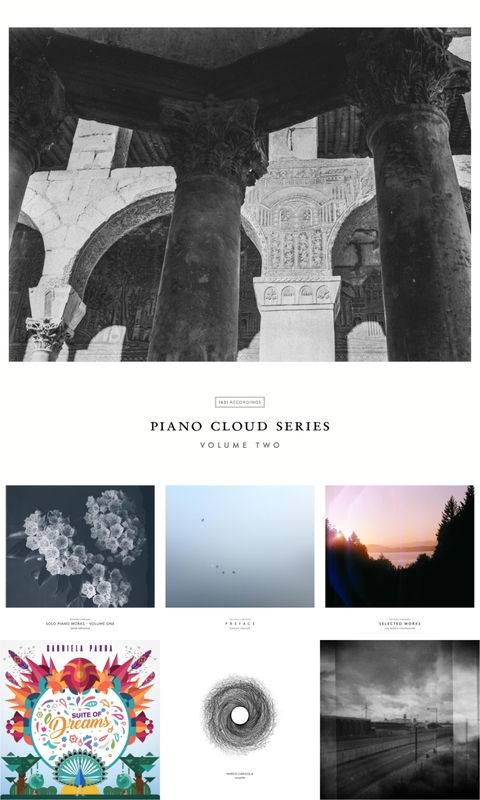 Most feature tender solo piano works, with some melodic and uplifting forays on guitar that will appeal to the ambient and post rock crowd as well. A lovely collection. Gabriela Parra is a composer and musician born in Amsterdam, but raised and educated in numerous places around the world such that she has developed a style “with strong classical and Euro-mediterranean roots where the old Hispanic melodies and harmonies play a dominant role”. Suite of Dreams represents her first full-length solo album and what a lovely one it is. Nine beautiful pieces rendered in a fluid and expressive playing style punctuated by interludes of stillness and reflection. Born in Bari, Italy and now living & working in London, composer Marco Caricola has worked on a variety of short films, visual projects, and contemporary dance pieces with a style that fuses delicate piano, chamber strings, and electronics. Innerfin is a rich amalgam of original compositions about half of which were drawn from his earlier film work which no doubts contributes to its distinctively cinematic feel and sense of narrative flow. Alternately lush, exhilarating, and intimate, it makes for a noteworthy debut. John-Patrick (JP) Hartnett is a London-based graphic designer, lecturer, writer and musician. Previously unfamiliar with his work, I was immediately drawn in by 8, a beguiling collection of five atmospherically enhanced pieces of piano music in a deeply oneiric mood. It is possessed of a fragile and disorienting beauty that taps right into the subconscious, a real gem.